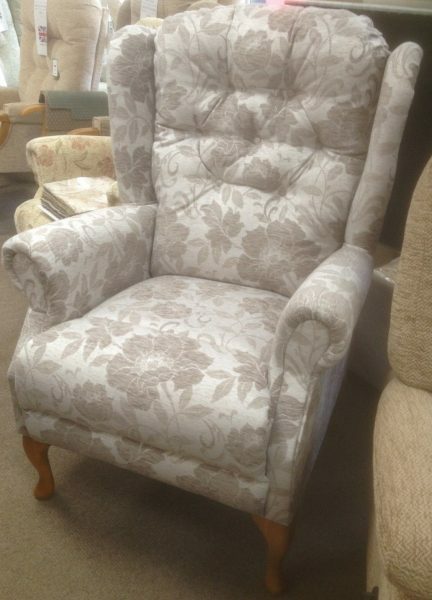 Langley Queen Anne de luxe grande size, Parker Knoll style chair. Also available in standard & petite sizes, refer to the High Seat Chairs page for details. This is the most popular chair in our high seat chair range. This chair comes with a wide choice of covers and wood finishes to the Queen Anne legs. 2 & 3 seater settees also available. 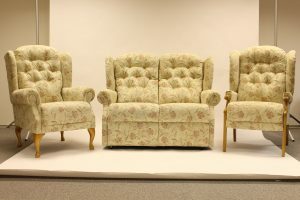 Available with Queen Anne legs, fully upholstered to floor or showood frame. Express delivery in 24 hours available on this chair in selected covers. Dimensions are approximate & subject to change without notice.